An unapologetically reverent celebrity tell-all without all that much to tell. 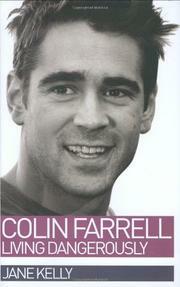 Hard-drinking Irish lad Colin Farrell is quite probably more recognizable from his ubiquitous presence in the tabloids than he is on the silver screen. Born and raised in an upper-middle-class suburb of Dublin, Farrell was given access to a large house, manicured lawn, doting mother and the best education in the country. Son of a (once) regionally famous football player, the youngest Farrell offspring was lackadaisical at best, delinquent at worst. His teen years were spent in a haze of drugs and booze, and it was only after failing at everything else—football, school, even as a sales assistant—that our non-working class hero wandered into acting, propelled more than anything by his movie-star looks. Acting school, bit indie-film parts and a small role on a soap opera followed, but Farrell’s breakthrough came when Kevin Spacey discovered him in a London play. The rest is, of course, the story of every modern movie star from Clooney to Cruise. Kelly’s book smacks of Irish pride and provincialism, making it dull for anyone outside of the British Isles. The writer tries to make her subject’s success symbolize that of a nation, yet her major misstep is to not recognize that Farrell is not only an unsympathetic character, but one-dimensional and prone to posturing. As one of the many sixth-degree sources tells Kelly, the actor is “posher than he makes out.” To substitute for a lack of depth, the writer almost obsessively harps on Farrell’s indulgent boozing and womanizing, perhaps thinking that, repeated enough, this will amount to some kind of personality. Plodding prose, factual errors, quotes culled from other interviews and sub–US Weekly photos add up to a pointless and poorly written celebography.